Group of the civilian POWs pose for a photo at the Sime Road Camp, 1945. 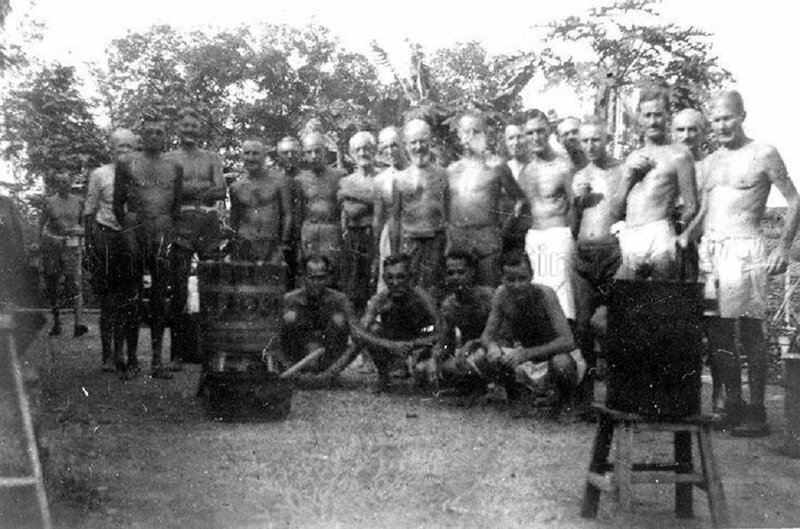 Image from Alex Glendinning Collection, courtesy of National Archives of Singapore. The "Sime Road" Trial as it became known involved one Japanese Captain and four civilians who were attached to the 61st Coy RASC (GT). The defendants were accused of ill-treating and, on occasion, assaulting civilians who were interned at the camp. One particular incident involving the camp rice store led to the brutal assult of one Mrs. Kirwan, leaving her severely injured. For these, three of the defendants were sentenced to death by hanging while the other two were given life and 7 year jail terms respectively. However, their sentences were mitigated or commuted. Although a petition on behalf of the defendants was never received, the sentences of the defendants were mitigated or commuted on the advise of JAG. The JAG advisory opinion stated that on the whole the evidence did not show any special degree of ill-treatment, although there were occassional and in some cases, savage assults. Furthermore, the conditions of the No. 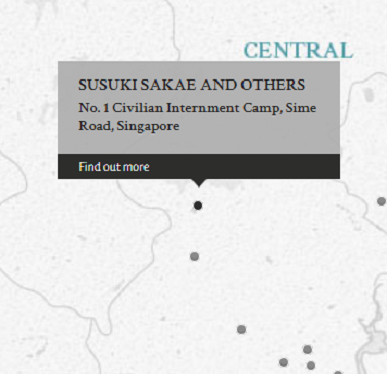 1 Civilian Internment Camp, while bad, were not comparable to other POW camps in Siam (present-day Thailand). The sentences thus were found to be "out of all proportion to the degree of guilt proved against each of the accused". The list of prosecution witnesses included among many notable persons, such as Lieutenant Colonel Samuel Harper-Ball, Commandant of Johore Defence Forces before Singapore, and Justice Newman Arthur Worley, of the Singapore Supreme Court and a lecturer of the then Raffles College, now Raffles Junior College. Susuki, Sakae. Captain. From Japanese military. From Japan. Guilty. Life imprisonment. Sentence reduced to 10 years' imprisonment. Tominaga, Jikko. Civilian. From Japan. Guilty. Death by hanging. Sentence reduced to 10 years' imprisonment. Kobayashi, Shoshiro. Civilian. From Japan. Guilty. Death by hanging. Sentence reduced to 10 years' imprisonment. Kawazui, Hatsuichi. Civilian. From Japan. Guilty. Death by hanging. Sentence reduced to 8 years' imprisonment. Miyamoto [Myamoto], Minoru. Civilian. From Japan. Guilty. 7 years' imprisonment. Sentence reduced to 1 year imprisonment. Eber, J. St. J. Barrister-at-Law, Inner Temple. Couch, M.J. Lieutenant Colonel. From British military. Solicitor of the Supreme Court. Yamada, Moizuo. High Court Judge of Nagoya, Japan. Fukushima, Sachio. Prosecutor, Tokyo, Japan.